Fiesta Del Asado has got to be my favourite place in Birmingham for steak or any sort of grilled meat come to think of it. I’ve never been to Argentina but it’s definitely somewhere I want to visit after sampling the wares of this Birmingham eatery. If you do decided to visit this restaurant next time you’re in Birmingham, be sure to try the bread and marinated gordal olives stuffed with guindilla (£2.99) while you peruse the menu. The olives are so delicious and have the perfect combination of sweetness, salt and a mammoth kick of chilli and I just can’t get enough of them. We visited with Grandma Gourmand who likes to accompany us on our culinary adventures when she comes to visit. You can always guarentee that Grandma will order something that everyone wants to taste and the Estofado de ternera (£19.89) was no exception. Cubed brisket braised for 12 hours in a malbec & salchichon sauce served with crisp potato and blackened corn was so filling that she was happy to share some with us. The sauce was truly delicious and the beef just melted in the mouth which is exactly what you want from a brisket. Grandpa Gourmand liked the Asado de tira (£21.49) so much during our previous visit that he couldn’t resist ordering again. 16oz 4 bone cross cut beef rib; cooked on the bone for a fuller flavour is the perfect dish for any meat lover. I ordered wisely as I knew I would get to sample a huge chunk of this! You may wonder why I opted for the Pollo a la parrilla (£14.89) and not a steak? I love steak and I love the taste of the steak from here so much but the last time we visited Baby Gourmand had the most delicous chicken and there was just no way I was going to visit without ordering a portion of the grilled 1/2 chicken marinated in garlic & thyme served with tomato, peppers and capers. [served on the bone] for myself, after all I knew I would get some of Grandpa Gourmand’s steak! No visit is complete without a portion of the papas fritas con perejil y ajo (£1.99) or fries with parsley and garlic and to be honest one portion just isn’t enough as they are so delicious. I can’t wait for my next visit to Fiesta Del Asado and hope it’s sooner rather than later as I need my grilled meat fix. Christmas is well and truly over, new year weight-loss resolutions of small portions, more greens and less meat, have been rigorously followed, and because it’s nearly February, its probably time to get back in the swing of things with some mega food. You may have thought talking about Christmas is a strange way to begin a food post, especially when the festive season is not long gone and you are almost glad to see the back of it, tinsel firmly back in its box, china wrapped for another year, and trees stuffed into the attic, however, one thing i’m absolutely glad to see the back of, is meat! So a month has passed and i’m just about beginning to miss the succulent chicken, mouth-watering beef, and all the trimmings, then out of the blue I have the opportunity to visit an Argentinian Steak House in Edgbaston, Birmingham. Well it has been a month, so time to get back on the horse! Fiesta Del Asado is Birmingham’s first Argentinian restaurant and surprising as this may sound, the first time that either myself or Mini Gourmand have visited a restaurant of this kind. We have passed similar establishments, glanced at the menu and obviously liked what we have seen, but always thought it the kind of place to visit for special occasion, and honestly just never got round to trying it. Another slightly obscure reason is Mini Gourmand doesn’t often order steak if we go out for food, often choosing something from the menu that she’s not likely to get at home, almost like a treat. Luckily for Mini Gourmand after leaving Fiesta Del Asado, she realised that what she had just eaten was NOTHING like he gets at home! We visited Fiesta Del Asado on a quiet Sunday afternoon at midday, not really thinking too much about food if i’m honest. We even had scrambled egg on toast for breakfast which is quite a hefty breakfast for either of us when we know we are going for lunch. We drove up to Birmingham and found the restaurant very easily, it was only a short distance outside of Birmingham located in a beautiful building, alongside many equally beautiful buildings in this area. Walking through the main entrance of Fiesta Del Asado and first impressions were good; very clean, deceptively large, and attractive décor allowing me to relax into the comfortable surroundings. Although there was only a handful of guests in at this early time the dining space was very relaxed, however, there was a buzz about that place indicating it would be really special and lively if visited during the evening. Before I forget, the staff, as common these days, were extremely pleasant, well dressed, and politely lead us to our table, immediately providing a high chair for Baby Gourmand before bringing water to the table while we looked through the menu. They also offered some olives and free bread which helped whet our appetite. The olives were gorgeous and had quite a spicy kick to them, a lot bigger kick than expected. The bread was warm and delicious, and the accompanying balsamic vinegar and olive oil perfect for dipping chunks of bread in! Mini Gourmand was distracting Baby Gourmand and asked me to order for her; the menu was pleasantly large, but not so large to water down the experience. I ordered two starters that we decided to share between us. First was Pastel de cangrejo, Crab cake served with sweetcorn salsa. (£5.79). This was a good starter, stuffed full of crab, including the meat from the claws, and was accompanied with a delicate side of dressed salad leaves. Thankfully the crab cake was light and thank god it was as you will discover as you read on! The second starter was Rabas fritas, Crisp baby squid rings with aioli sauce. (£5.79). Oh my, this is definitely one of my favourite all time starters. The squid was perfectly cooked, not chewy, but just enough bite and consistency to cut in half if you bit into it hard enough. The garlic, buttery sauce was also delicious, even baby Gourmand seemed to have a taste for it when we caught him dipping his chips in and sucking the garlic off which then turned into just dipping his fingers in!! Mini Gourmand had the Asado de Tira, 16oz 4 bone cross cut beef rib; cooked on the bone for a fuller flavour. (£18.79). Oh my god, when this came to the table she nearly jumped out of his skin! and so did the guests sitting alongside us! The smell was intoxicating, a char-grilled spectacle. The waiter instantly noticed the startled look on Mini Gourmands face, he must have seen this face many times before when serving up a monstrous plate of meat like this. He lent down next to Mini Gourmand, like we do to Baby Gourmand when explaining something simple for the first time, and gave some very useful advise on how to work his way through the mountain of succulent beef. “start with the middle two sections.” he said, ” then cut the slightly tougher parts (pointing at the left hand side of the rib on the photo) into small chunks, and if you finish that, cut out the remaining chunks from between the ribs.” Mini Gourmand followed his advice and half way through the second rib was boasting how she was going to easily finish this dish off, yeah right! 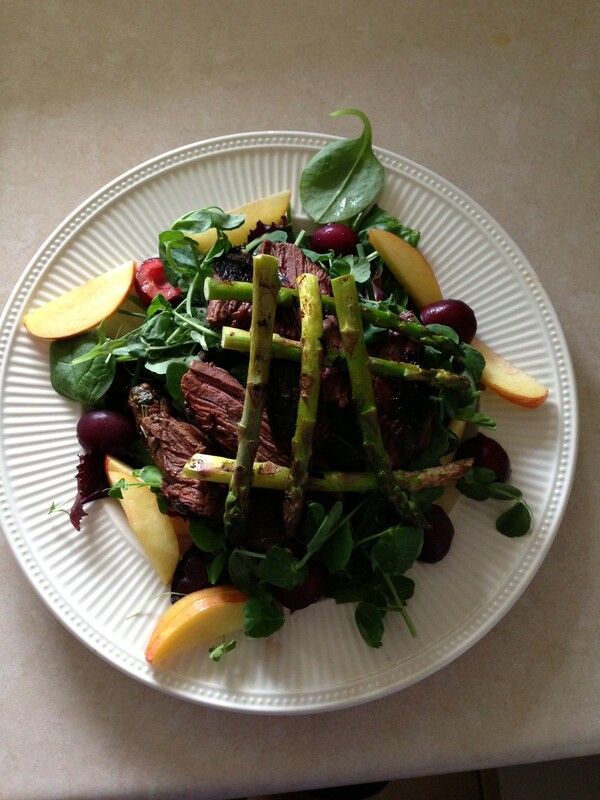 The smells, sight, juices, accompanying chimichurri, in fact everything, was a complete package. It was a work of art, not too reliant on flavourings and smokiness, it was perfect. In fact looking at the photos bring back the mouth-watering taste over, and over again. It was one of those meals, something you will remember, and even years down the line, a feint smell will bring back the taste-recall of this exquisite meal. Suffice to say, Mini Gourmand did leave some, but to her credit, not as much as i thought when he started. I ordered the Brochette de cuadril, Skewered chunks of beef rump with peppers onion and tomato basted with rosemary and garlic. (£16.99) I’m not sure why I ordered this as I love nothing better than a bloody hunk of meat on my plate but something drew me to this dish and I’m very glad I picked it. After seeing the monster that Mini Gourmand was left to contend with I thought mine would be an easy feat however I was stuffed by the time I finished. The steak was cooked to perfection and to be honest when I was half way through I started to wish I hadn’t been so greedy by ordering side dishes. 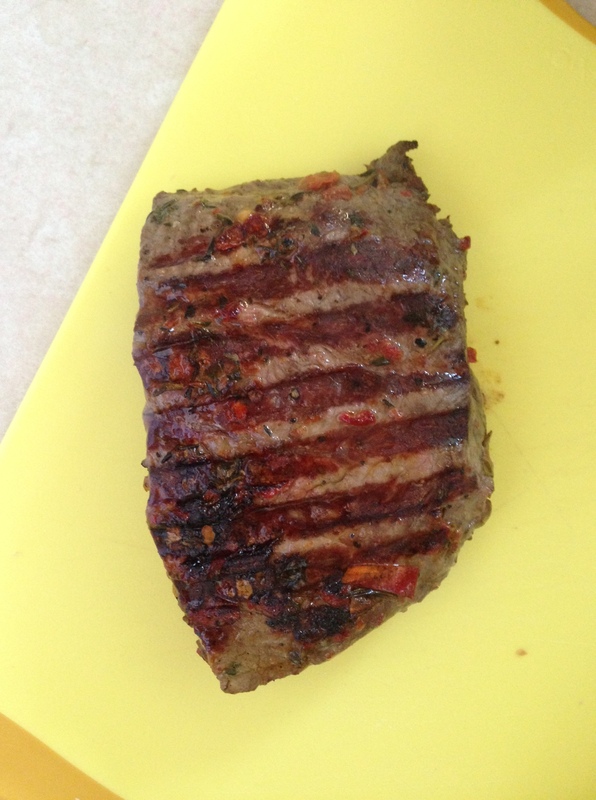 Just like Mini Gourmands steak, my meat didn’t rely on any fancy flavourings as the meat alone had such an amazing taste which lingered on my tastebuds long after I had finished. Ok, about now you are probably thinking surely they didn’t order sides as well…well, we did. We did go simple though with Salteado de vegetales mixtos, Selection of vegetables tossed in lemon and butter. (£2.99). Very simple and very nice, butternut squash and peppers. delicious, but possibly one dish too many. Then of course was the second side. Papas fritas con perejil y ajo, Fries with parsley and garlic. (£1.99). Possibly in the top 5 of my favourite chips of all time? We nibbled at these in between giving up on the main courses, then back again, and again, and again. Delicious! Lets not leave out Baby Gourmand. 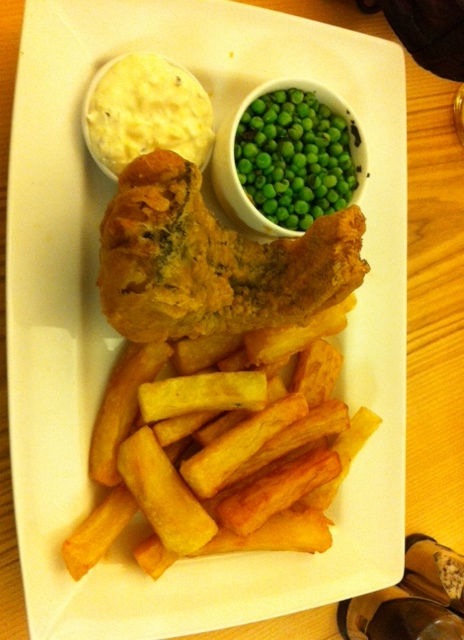 We had no idea what he would like so decided on chicken and chips. Alitas de pollo, Grilled chicken wings served with mixed leaves and hand cut fries (£3.95). Lets get one thing straight, on any other given day this one dish would have been perfect for anyone in the Gourmand clan. 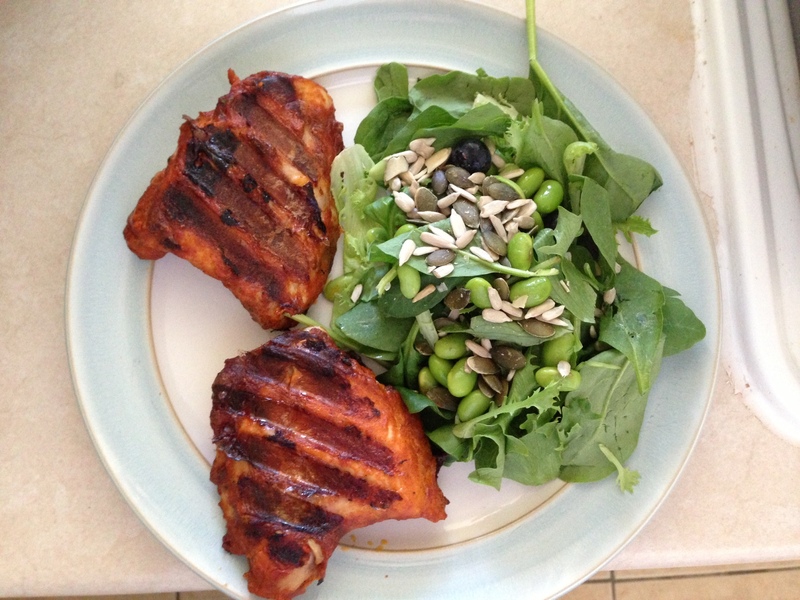 The chicken had the same char-grilled flavour of the main courses and the salad was outstanding. In fact, this dish pretty much became the third starter as we took it in turns blowing on the food, one bite for Baby Gourmand, one bite for Madame Gourmand…. Overall I rate this place highly. Yes, I couldn’t go every weekend, and yes you could probably rack up quite a bill if there was a group of you and the red wine started flowing (which I can imagine happens often! ), however, you get what you pay for, and I would describe the Fiesta Del Asado experience as reassuingly expensive. The restaurant feels quality, tastes quality, the staff excellent, and happily went the extra mile, including at one point the manager coming over to help entertain Baby Gourmand after spotting the tell-tale sign of being in the high chair for too long. One thing I would like to add is that Leamington Spa NEEDS a Fiesta Del Asado, I’ve even been planning in my head where I think it should go! If you would like the Fiesta Del Asado experience you need to head to 229 Hagley Road, Birmingham, West Midlands B16 9RP. 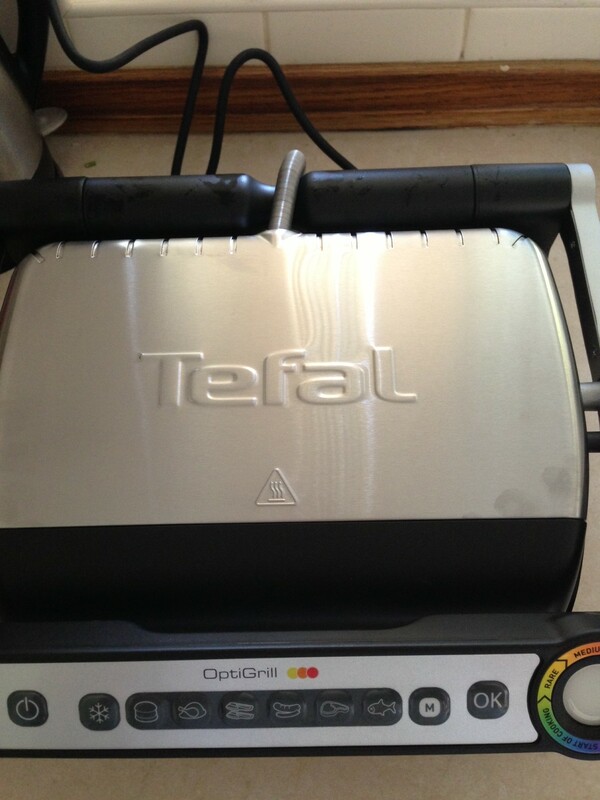 I previously posted about the Tefal OptiGrill post in this post here, I had only used it a couple of times so couldn’t do a completely thorough review of the product. 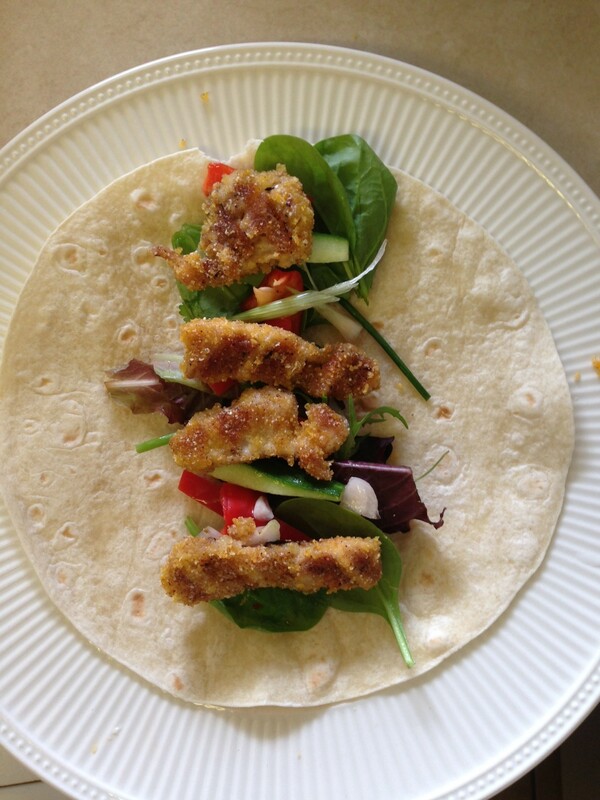 Since I wrote the post above I have used the Tefal OptiGrill to cook most of my meals, yesterday it was used to cook Breaded Chicken (Homemade) wraps and Steak Salad. The Chicken wraps were simple to make, I cut up some chicken thighs, placed them in a bowl with some breadcrumbs and rapeseed oil mixed them around and placed on the OptiGrill for a couple of minutes until cooked. Previously I would have cooked the chicken in the oven and would have spent ages soaking a baking tray after cooking to remove the stuck on breadcrumbs but with the Tefal Optigrill I didn’t have this problem. 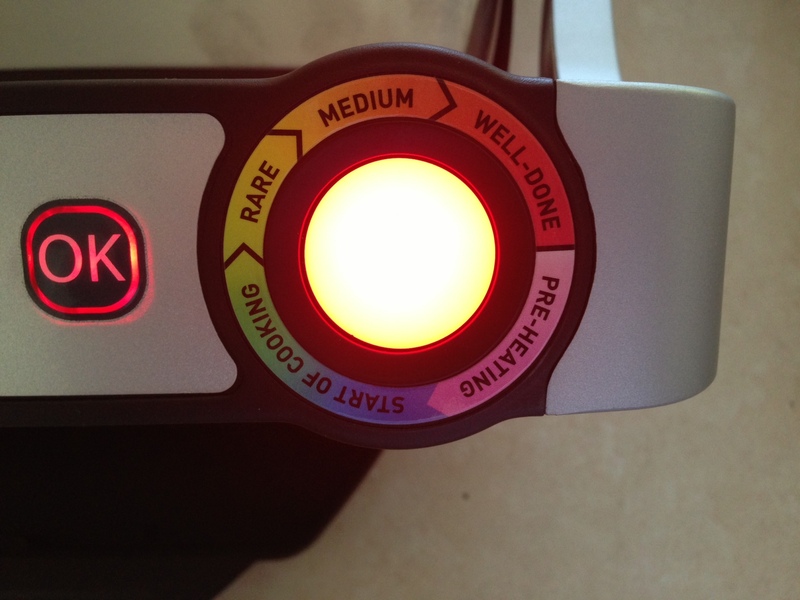 One thing that the Tefal Optigrill cooks extremely well is steak, all kinds of steak. The steak used for the salad above was flat iron steak which was actually sold at the butchers for use on a barbecue but I figured it would work just as well on the OptiGrill. Once cooked the steak was buttery soft and melted in the mouth. I’m definitely an OptiGrill convert and can’t wait to cook my next meal in it this evening which will be a boneless leg of lamb. Yesterday I was at hospital being fitted with a cast on my right hand after fracturing a bone in my right wrist, as I’m the cook in our household I was very worried about how I was going to feed my family (It’s amazing how many things require both hands in the kitchen). 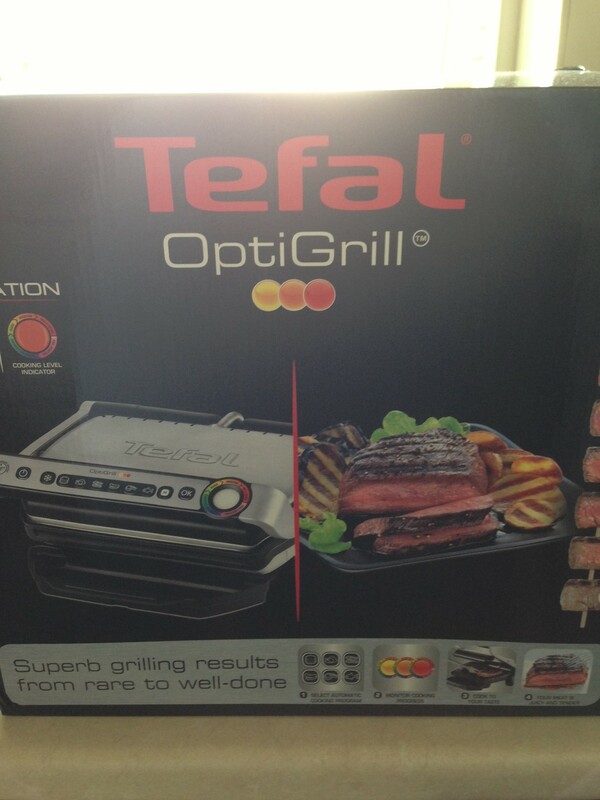 I received delivery of one of Tefal’s new products this morning, the Optigrill which Tefal claim is like having a professional grill chef at home. 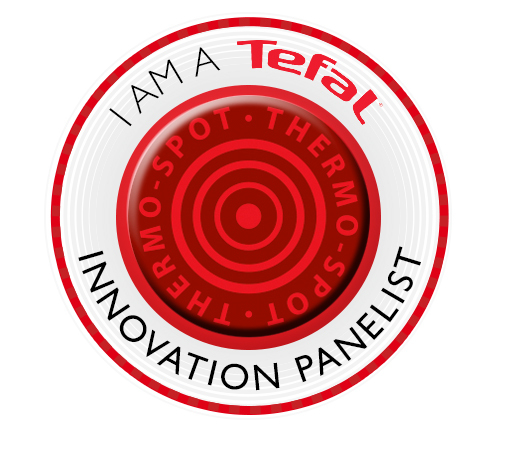 Every Tefal product I own takes the strain and stress out of cooking and I had high hopes for this product. The OptiGrill has six cooking programmes for meat, fish, bacon, chicken, burgers and sausages plus a manual option. 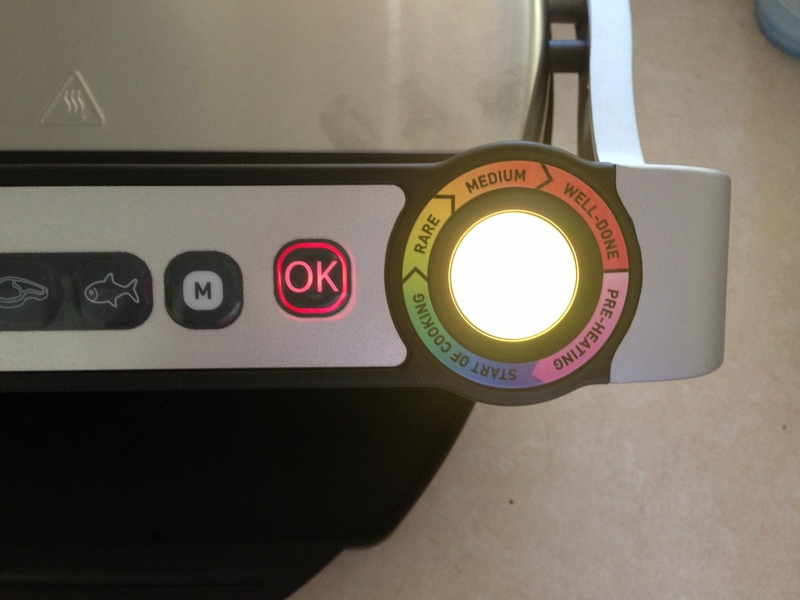 The unique colour changing LED screen on the handle is used to check cooking progress, this reveals how your food is cooking and allows you to see exactly when the food is done. When cooking steak the light is yellow for rare, orange for medium and red for well done. 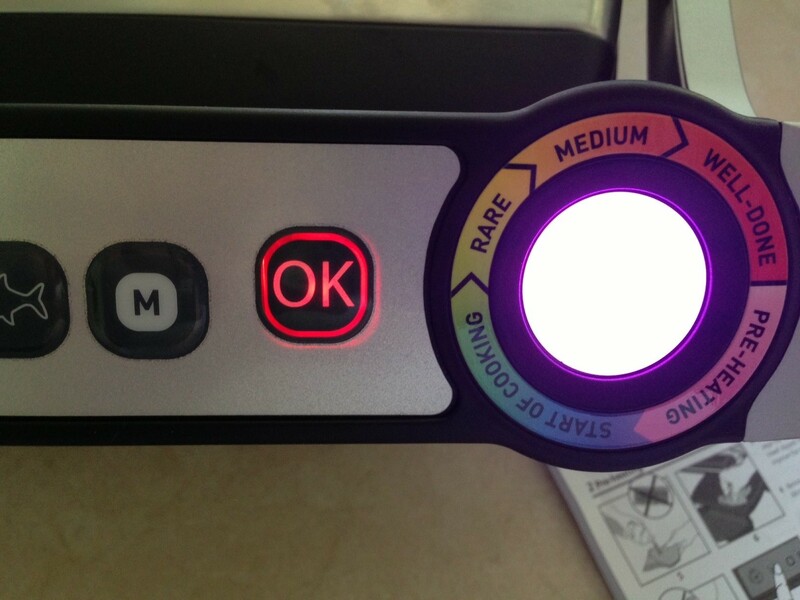 The OptiGrill will also beep at each cooking stage so you don’t need to stand over the device. Once the grill is hot enough the light will change to pale blue. 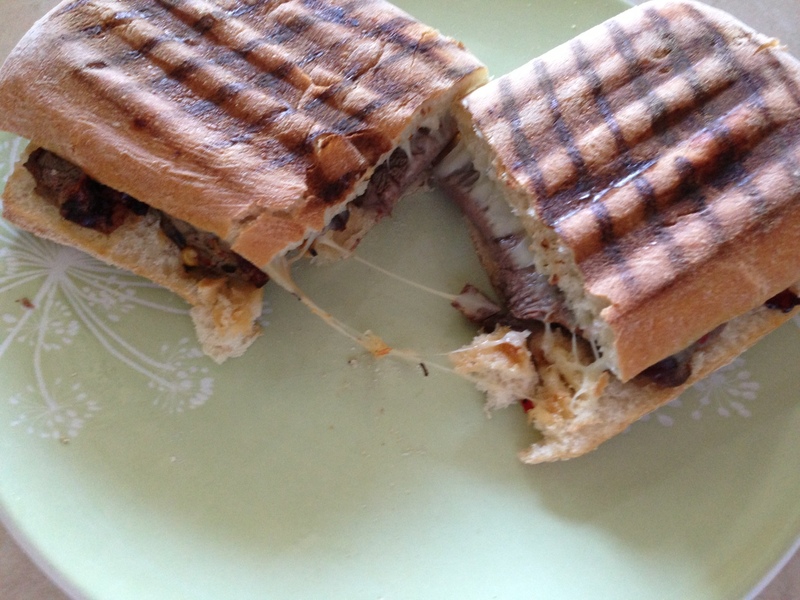 Mr Gourmand and I had Flat iron steak pannini with salad, the steak was cooked medium, placed in the paninni with some cheese and popped back in the OptiGrill to brown the bun. The cooking surface is very large and is coated with Tefal’s superb non-stick coating, the cooking plate has a 7″ inclination for easy fat release. The OptiGrill sears food at high temperatures which locks in flavour and juice. 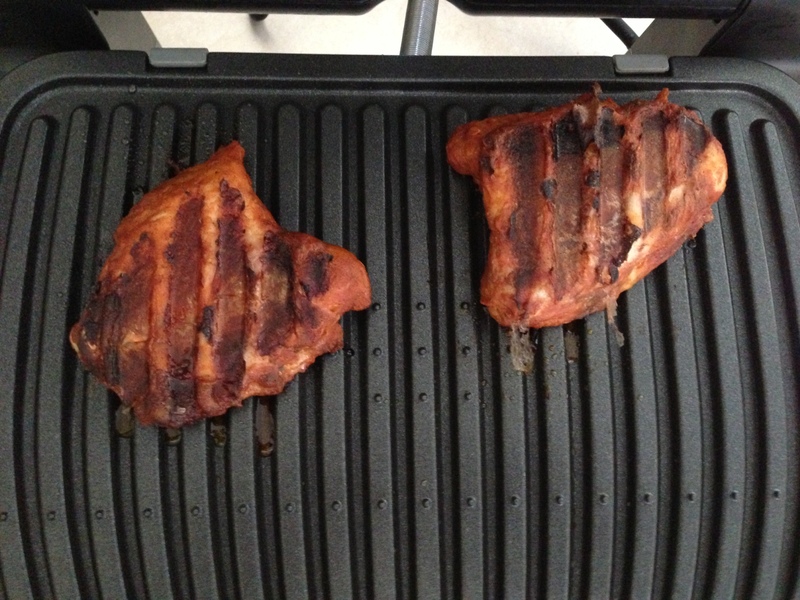 Food is left with appetising grill pan markings, as we eat with our eyes this can only be a good thing. 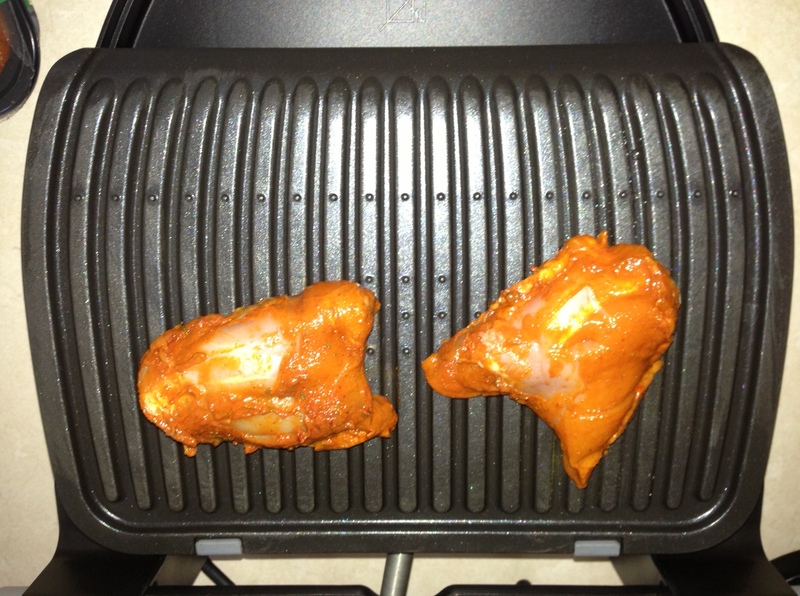 No oil is necessary when using the OptiGrill which makes it perfect for low fat family cooking. 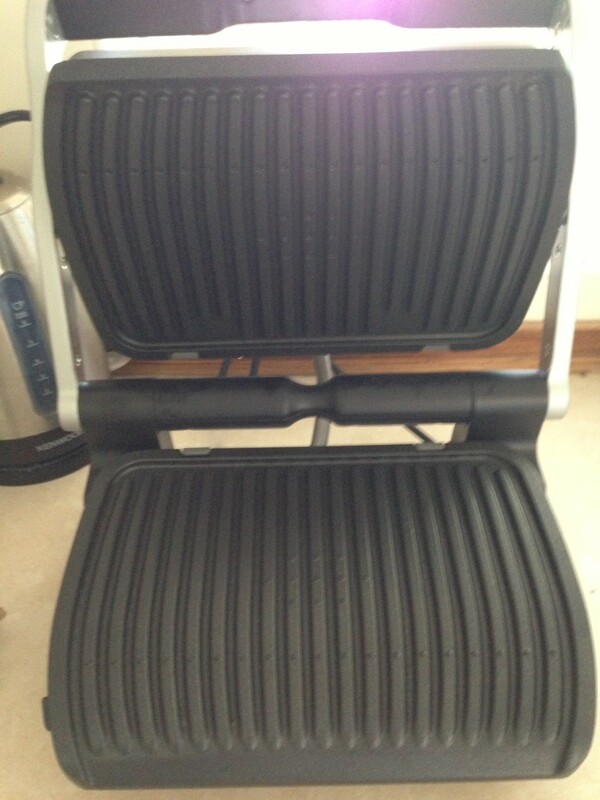 We don’t have a garden which means we can’t have barbecues, I really miss barbecued food in the summer but after using the Optigrill I’m so please I can now enjoy grilled food without my hair and clothes smelling of smoke. I can’t wait to give this product a proper road test, I have some great ideas for kebabs, fish, burgers, boneless spatchcock chicken, sandwiches, vegetables and chicken tikka. RRP £129.99 Visit www.tefal.co.uk for stockists. The Woodland Grange hotel is situated on Old Milverton lane, Leamington Spa. We stayed at Woodland Grange on a dinner bed and breakfast package, the website pictures showed delicious food and there was a sample 3 course menu to peruse which had my mouth watering. My excitement about the food ended there unfortunately, we dressed for dinner and headed downstairs only to be told that the restaurant wasn’t open on a Sunday evening and if we wanted food we would have to order from the bar menu. The bar was tiny and had 3 small tables which were already full, luckily the hotel was also a conference centre and had high and low tables dotted around the foyer so we found ourself a seat and had a quick look at the menu. 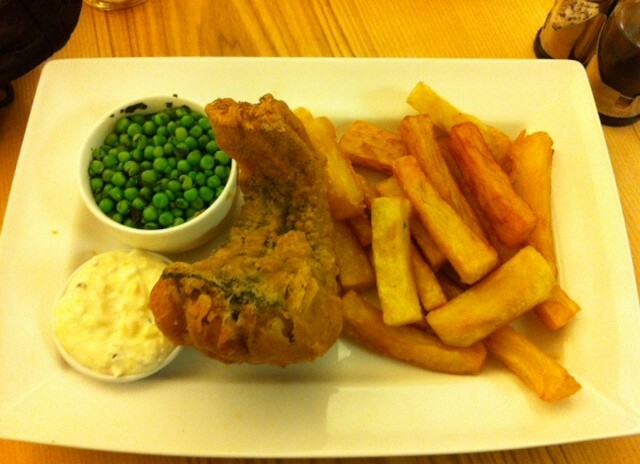 I picked the West Country battered Coley with crushed minted peas and gribiche sauce (£11.50) Although edible the fish and chips tasted very dry, as though they had been under the heat lamp for too long. The minted peas were rather delicious and the gribiche sauce was lovely and something I’d never tried before. 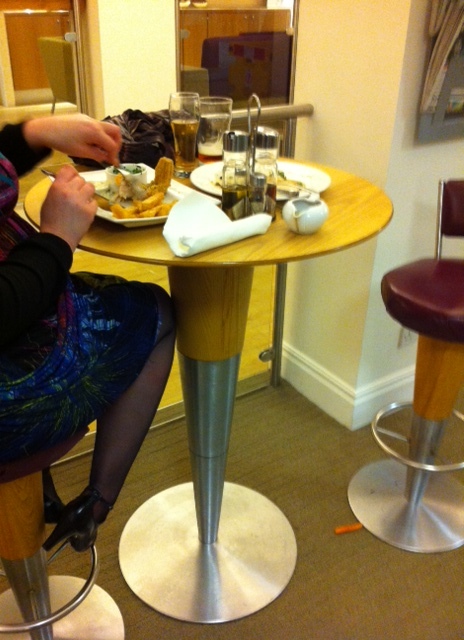 The high tables were very uncomfortable making eating a meal difficult. 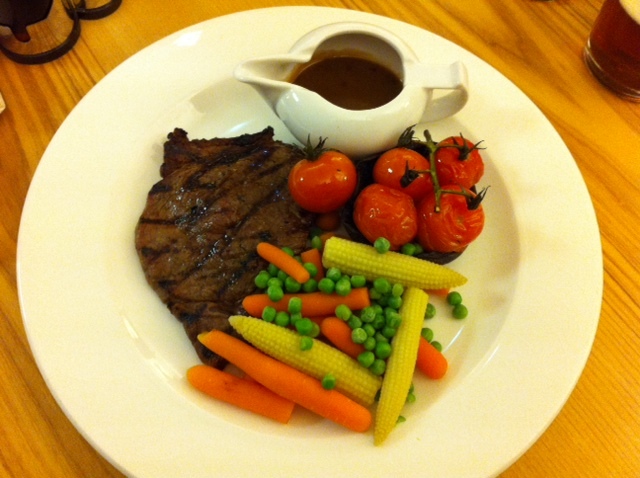 Mr Gourmand had the Chargrilled rump steak with confit cherry tomatoes, portabella mushroom and vegetables instead of chips (£14.50). The steak was served with a peppercorn sauce which was unfortunately too thick to pour. Mr Gourmand enjoyed his steak and was glad that he chose to have vegetables rather than chips as my chips had been very dry and tasteless. I probably wouldn’t visit Woodland Grange again, if I had been told during booking that the restaurant wasn’t available on Sunday evenings I would have stayed elsewhere as it was the restaurant meals that had initially inspired my booking. 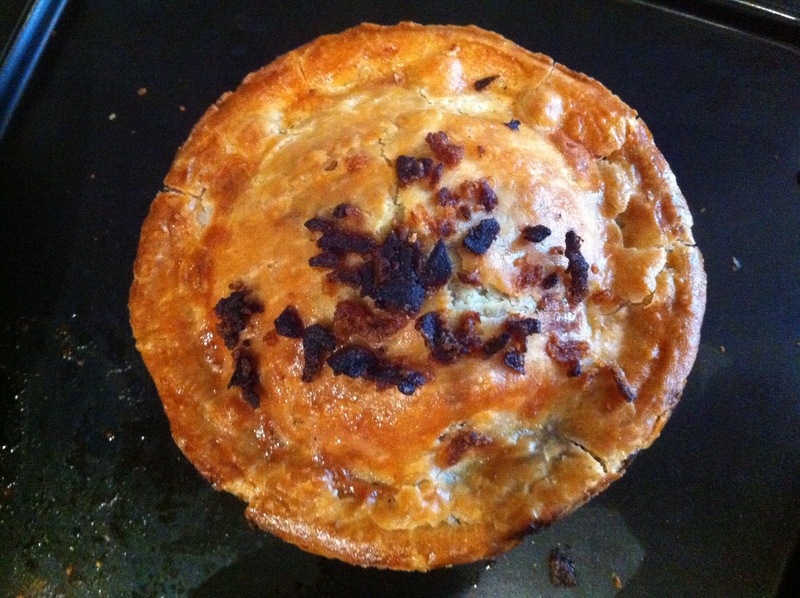 Day 5’s installment is another Pieminster offering, this time with meat!! 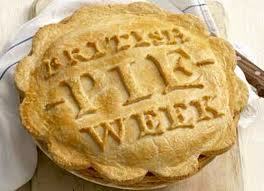 I can’t believe we’re at day 5 of British pie week already, I’m actually ashamed at myself that I’ve eaten 5 pies so far! Bang goes the diet! It probably wouldn’t have been so bad if Mr Gourmand had been here as I could have just had a nibble while he did the tasting! 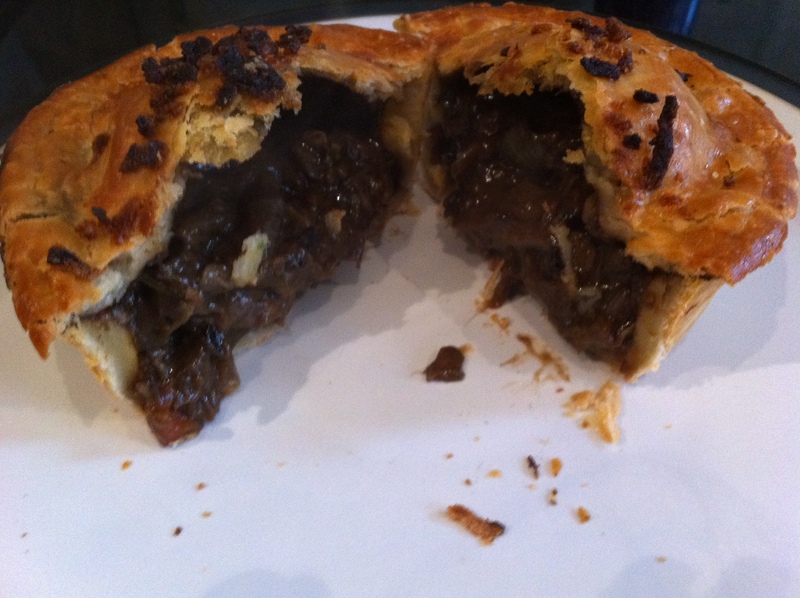 The Moo pie (£3.50) apart from having a fantastic name is a british beef steak, real ale, fresh herbs and rich gravy pie. Rather different from the Heidi pie as this one contains meat! Seconds after this picture was taken the crispy onion sprinkles were picked off and shoved in my mouth! Although the photograph of this pie makes the filling look super runny, the pie could actually be held in the hand to eat. The steak was so tender, in fact it was melt in the mouth tender. The gravy was rich with a hint of spice and herbs. 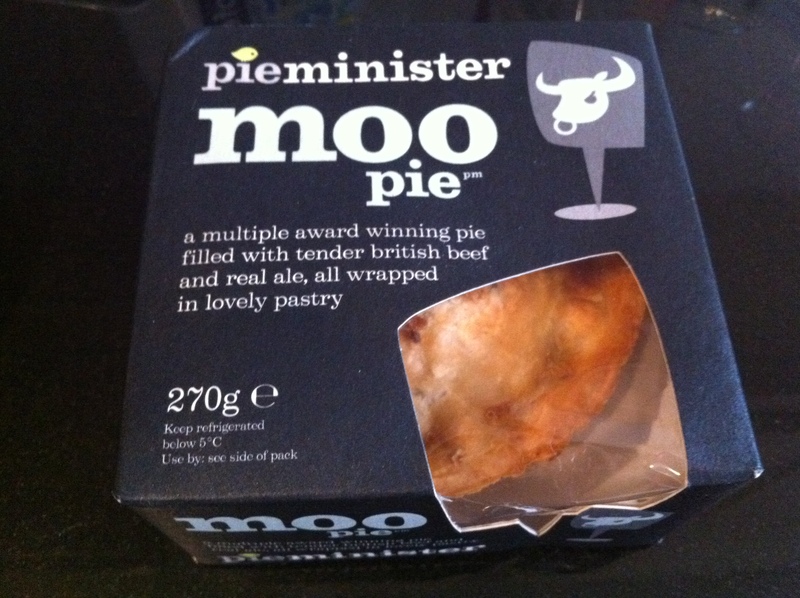 The pieminster guys know how to make pastry, like the Heidi pie the pastry on the Moo was crisp on the outside and soft inside, not too thick and was simply delicious. The next steak pie I eat has a lot to live up to!